7.23 points at 22 votes (rank 289). Rombachs C64-Spieleführer 9 September 1984 - "Voting 2"
In the SID the melody of Star Wars is played, that's why I suppose that there is a corresponding "Star Wars-Level". However, the "Star-Wars"-thing is not quite correct. In the fourth stage (World War III?) you can hear the "Imperial March" from the 5th movie. After the Korean War you get transported to the Vietnam War (1970). If you are successful again, you enter World War III. 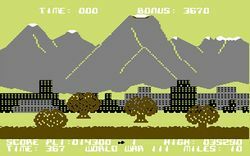 Then the world and the C64 are destroyed (only a joke from the game) . It continues with the War of Mutations, to finally get to the beginning of time. There you fight against flying dinosaurs, stone age men and devils (in any event some small creatures with horns that throw spears). 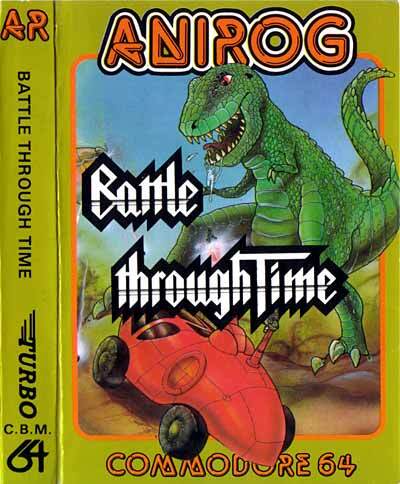 The level ends with a end fight against a big dinosaur. Then you get to level 2..... the same again from the start. 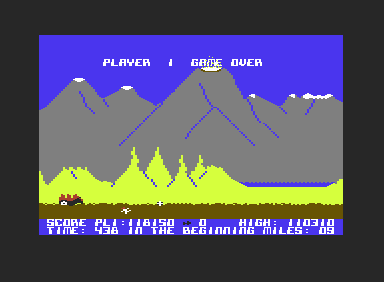 The game is multi-coloured and scrolls speedily from right to left. There are different pieces of music at each level. Sound effects are also there. Slight animations and level fading in and out can be found. 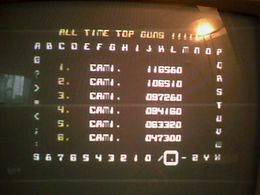 In the lower part of the screen is a status display, which shows the player in the first line (from left to right) his current points, the number of lives and the highscore and in the second line the time left, the name of the level and the miles already covered. In the selection menu you can choose a game in the beginner mode (level 1) or the advanced mode (level 8) for one or two persons or restart with the last level played (works only correctly in levels 1 to 14). 500 points for shooting falling rockets, bombs, missiles etc. In each game you start with 5 lives, you have 500 seconds and you have to drive 10 miles. The game is very difficult. If you want to see the end fight with the dinosaur, you should switch off the sprite collision and get there through the warp mode (possible with the emulator VICE). 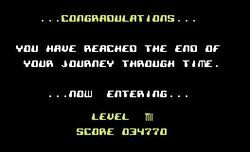 Generally: in every level drive quickly, shoot obstacles and flying things. Try to shoot missiles or avoid a collision with flying objects, so the vehicle doesn't get hit. Alternatively you can jump over small stones. You must jump over holes in the street! 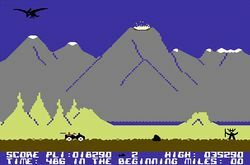 In level 1, World War I (1917), and level 2 World War II (1941), you are ambushed by airplanes, which throw rockets and bombs. In level, 3 Korea (1950), the holes in the ground are hard to see. Quick airplanes throw bombs in a different rate, coming on different heights and by turns from the left and right. Level 4, Vietnam (1970), is in contrast to level 3 easier to play. There are helicopter attacks from the left and right in different heights. In level 5, World War III in the future you should try to avoid the thunderbolts of the cloud and shoot the roboto-like ufo, which shoots with lasers. In level 6, War Mutations, barricades and mutations from burrows must be shot. Definitely jump over the black burrows. To make sure that no mutation jumps out suddenly, try to get there slowly and then shoot. In level 7, In the Beginning, prehistoric men, that cannot be shot, throw spears, sticks and boomerangs. Avoid these if necessary by jumping. It is important to chase the flying dinosaur away by hitting it at least 4 times. It will fly away when it has the black colour again. The end boss, Tyranosaur Rex, should get hit endlessly until it flashes. Levels 8 to 14 are actually level 1 to 7 only with the difficulty level 2. In levels 8 to 12 the volcano is active and throws additionally stones onto the street, which cause holes. In level 12 (War Mutations) the thunderbolts also destroy the street. Here only well-timed jumps help. Level 14 is followed again by level 1. Sledgie: "The game is a clone of the classic Moon Patrol. As I have only been to the first level up to now, I cannot say anything about the other ones. The first impression is mediocre to good, so I give the game a 7." Rombachs C64-Spieleführer: "It counts to the Moon-Patrol programs where much skill in the handling of the joystick and quick reaction is needed. The ones who don't have any game from this group yet are recommended Battle through Time." 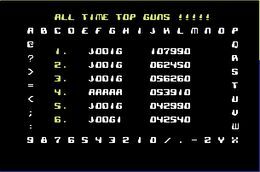 Jodigi: "I love games like Moon Buggy. This version at hand is bloody difficult, although it doesn't look like this at first sight, but it is as gripping as the ur-version." This page was last modified on 6 April 2019, at 21:26.